In a runoff election, Richard G. Thissen was elected National President of the National Active and Retired Federal Employees at the 33rd NARFE National Convention in Orlando, Fla., August 24 to 29. Thissen, of Lake Ozark, Mo., and the former national treasurer, received 61.47 percent of the vote to 38.53 percent for Ken Thomas, past president of the Florida Federation. The runoff was necessitated when none of the three candidates vying for the position garnered a majority of the vote on the first ballot. The third candidate for National President was Elaine Hughes, of Ashville, N.C., and the former national secretary. Also elected was Jon Dowie, of St. Augustine, Fla., to serve as National Secretary-Treasurer, a combined position for the first time. Evelyn Kirby, of Chester, Md., ran unopposed as NARFE Regional Vice President, Region II. Fifty delegates represented the Maryland Federation of NARFE Chapters. Delegates to the convention numbered over 800. Office of Personnel Management (OPM) Director Katherine Archuleta was the Keynote speaker. Archuleta thanked NARFE for its “tireless support of our federal family” and asked members for their help in recruiting young people to government work. As the US President’s “chief recruiter” Archuleta said that she had visited 10 colleges and universities since becoming OPM director in November 2013, and also has met with veterans and community groups “to spread the word” about federal service. Archuleta asked attendees to talk with their friends and families about their careers. “Talk to young people about your experience as a federal employee,” she urged. “As federal employees, you could have had more money and more perks in the private sector,” she pointed out. “But you joined the federal workforce because you had a calling to serve your fellow Americans,” she said. She also talked to attendees on Phased Retirement, Federal Employees Health Benefits Program (FEHBP) and Retirement Services. She recommended annuitants go to OPM’s Retirement Services Online, www.serviceonline.opm.gov, for answers to routine questions and concerns and to save the call center for problems and concerns that cannot be resolved online. Rep. John Mica, R-FL, welcomed delegates to Central Florida, and saluted NARFE for its advocacy on behalf of active and retired federal employees. 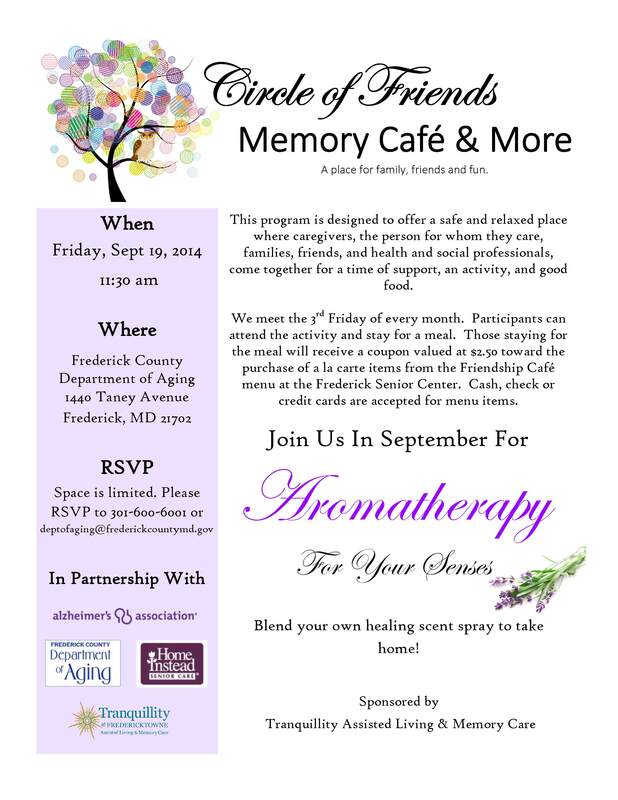 He highlighted his initiation of legislation that established the Federal Long Term Care Insurance Program. US Rep. Alan Grayson, D-FL, echoed OPM Director Archuleta‘s sentiments when he told the delegates that they don’t have to apologize for having been public servants, an experience he can relate to. He started in the federal government at the age of 18 with the Veterans Administration and a union member. Delegates passed resolutions to reduce the number of National officers from four to two and to use the Future of NARFE report as a starting point for future changes in the NARFE organization. A number of other resolutions were voted on and will be discussed in the next issue of narfe Magazine. 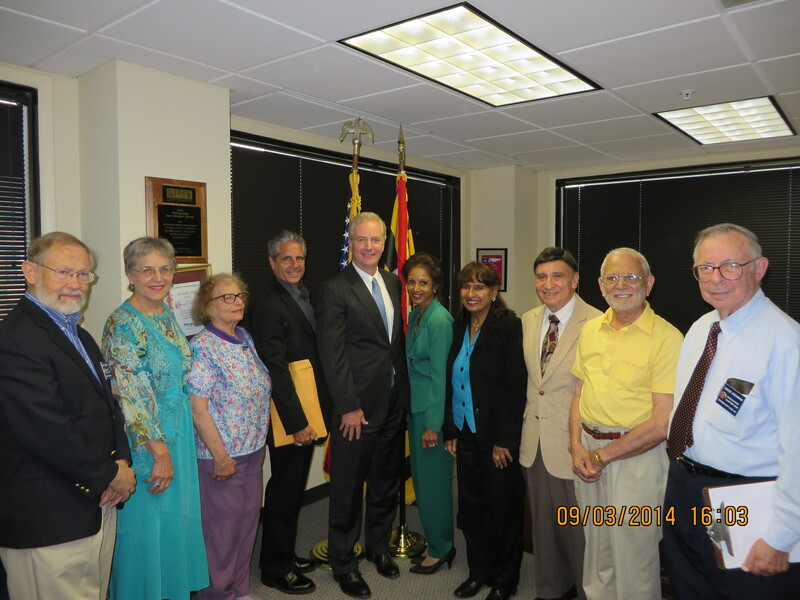 Congressman Chris Van Hollen, Ranking Minority Member of the House Budget Committee, met in his office with a delegation of NARFE Chapter Presidents and Members on September 3, 2014. 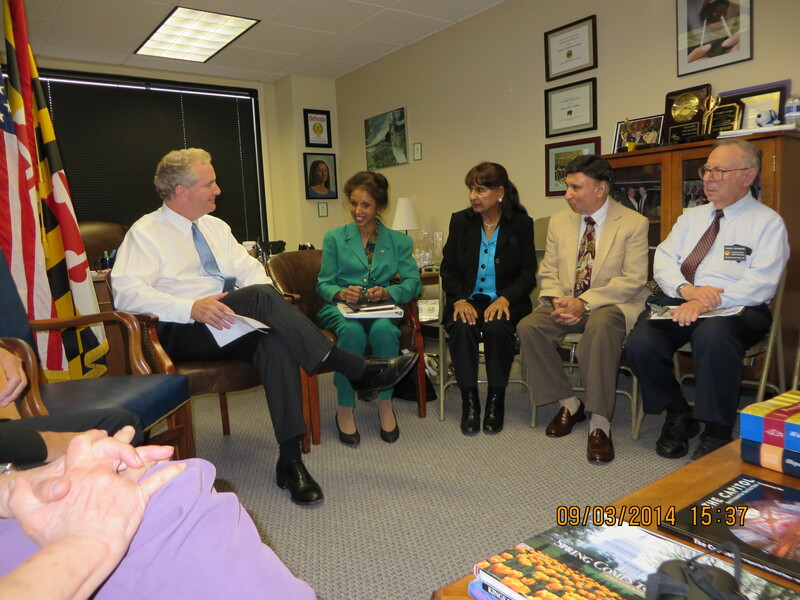 Federation Legislative Committee Chair Sudha Haley, Ph.D. organized this meeting to discuss NARFE members’ issues and concerns with the Congressman. Among the items he addressed were: current appropriations bills, length of a Continuing Resolution, probability of another government shutdown, an Omnibus Spending Bill, Chained CPI, CPI-E, COLA calculations, raising the minimum wage, jobs creation, funding for active feds, active military, retirees’ and veterans’ health benefits and for caregivers of Alzheimer’s patients and of wounded warriors, how would conflicts in the Ukraine Syria, Iraq, be funded, and how safe are our earned benefits including Medicare, Social Security and our pension benefits. These and other relevant issues and concerns from participants were discussed. The Congressman remains a champion for active and retired federal and military employees and retirees. 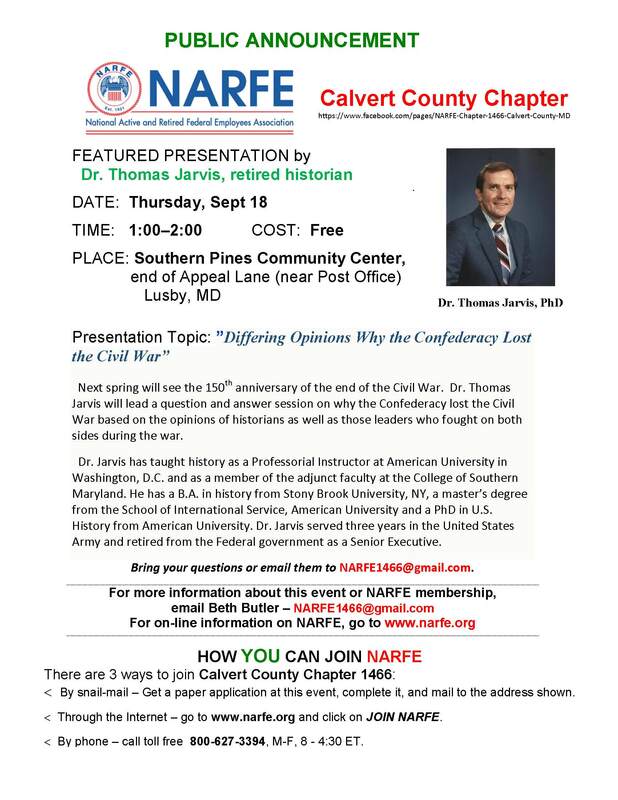 The Maryland Federation Legislative Committee will continue to organize such legislative activist events under the guidance and leadership of the Federation’s President Dan McGrath, the Vice President Bishop Dr. Gary Roundtree, and NARFE Headquarters.